Welcome to my turn celebrating Amanda Jean of Crazy Mom Quilt's new fabric collection for Connecting Threads, Good Neighbors! I was lucky enough to get an early peek at Good Neighbors (which is now available!) and it is really just a perfect collection for piecing and quilting. And pincushion making! There are a rainbow assortment of monochromatic prints, just my style. I received a charm pack for stitching up my pincushion. I decided to step into a time machine and go way back on my blog to 2011. I created a paper pieced spool quilt block, inspired by this mini quilt from 4 years ago. I arranged my fabric "thread" in a rainbow gradient. For the background I used a linen. The back of the pincushion is an awesome red and white dot print from Good Neighbors. I filled my pin cushion with crushed walnut shells, purchased at my local pet store in the reptile section. Yep, you never know what you are going to use when sewing. If you'd like to make your own mini spool pincushion, I put together this paper piecing template for you! Just click on the image to download it. Be sure to print it at 100% or "Actual Size", and check the scale icon before piecing. The pattern is charm pack friendly and finishes up at 4-1/2" x 4-1/2". 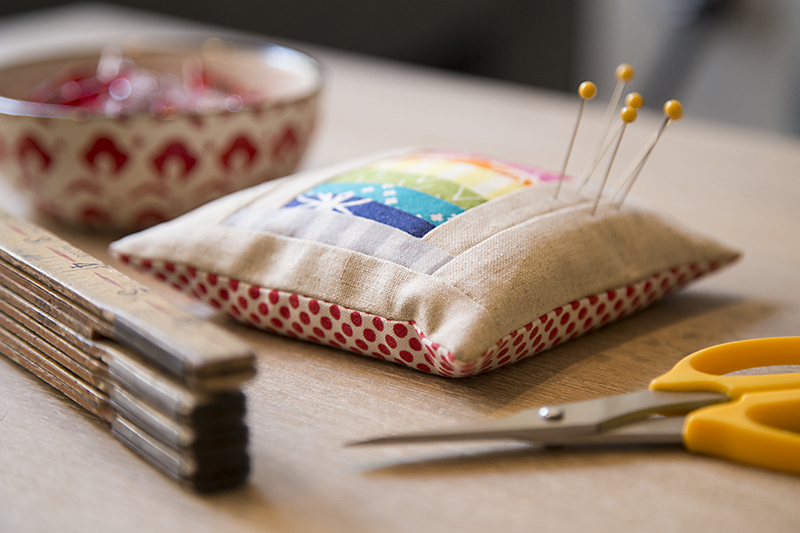 Follow along the below schedule all month to see more pincushions and be inspired!